Be Nice Even if Others are Not.. In our lives we encounter people who harm us, insult us, plot against us, whose actions seem calculated to thwart the successful achievement of our goals. Sometimes these are obvious acts, such as a co-worker who continually steals our ideas or speaks badly of us to our boss. Sometimes these acts are subtle – a friend, relative or colleague who unexpectedly betrays us or who we find has been surreptitiously speaking negatively about us behind our back. Slowly we find that our own actions, words and thoughts become driven by anger and pain. We find ourselves engaged in cunning thoughts of revenge. Before we realise it, we are injuring ourselves by allowing negative emotions dominate us. They insulted us or plotted against us or sabotaged a well-deserved achievement at work. But we injure ourselves more deeply and more gravely by allowing our hearts and minds to darken. Our dharma is to be kind, pure, honest, giving, sharing and caring. Others, due to ignorance, lack of understanding or due to the way in which their own karmic drama is unfolding, may act with malice, deceit, selfishness and indifference. But we must not let their actions or their ignorance deprive us of fulfilling our dharma. We must not allow ourselves to be lowered by their ignorance, their habits or their greed. The darkness in their heart should not be allowed to penetrate into the lightness of our hearts. Therefore, carefully picking up the scorpion, the monk rescued it from drowning and was just about to set it down gently on land when the scorpion stung his finger. In pain, the sadhu instinctively flung his hand and the scorpion went flying, back into the river. 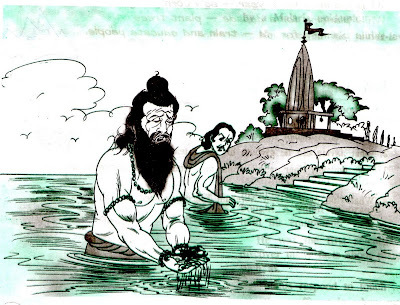 As soon as the sadhu regained his composure from the sting, he again lifted the scorpion out of the water. Again, before he could set the scorpion safely on land, the creature stung him. This drama went on for several minutes as the sadhu continued to try to save the life of the drowning scorpion and the scorpion continued to sting his saviour's hand before reaching the freedom of the riverbank. A hunter watched as the saint carefully and gingerly lifted the creature out of the water, only to fling it back in as he convulsed in pain from each fresh sting. Finally, the hunter said to the sadhu, "Forgive me for my frankness, but it is clear that the scorpion is simply going to continue to sting you each and every time you try to carry it to safety. Why don't you give up and just let it drown?" The sadhu replied: "My dear child, the scorpion is not stinging me out of malice or evil intent. Just as it is the water's nature to make me wet, so it is the scorpion's nature to sting. He doesn't realise that I am carrying him to safety. That is a level of conscious comprehension greater than what his brain can achieve. But, just as it is the scorpion's nature to sting, so it is my nature to save. Just as he is not leaving his nature, why should I leave my nature? My dharma is to help any creature of any kind – human or animal. Why should I let a small scorpion rob me of the divine nature which I have cultivated through years of sadhana?"